As you can see this journey took place over 3 months ago, but I did not post a blog expecting to be doing the return journey before Christmas, however that did not happen. So back 3 months and I cannot find any photos! I am not sure I even took any as it was very much a 'working' trip to get the boat back to Crafted Boats for a few jobs to be done. I think the weather was okay - I don't remember getting wet! Mind you I was not riding on the boat as I was leap frogging with the car. First stop from the Marina - the car park at the Eagle and Sun (long before opening, so I got away with it) and across the road to help Chris through the three locks at Hanbury. Second stop by lock 18 on the Astwood Flight. 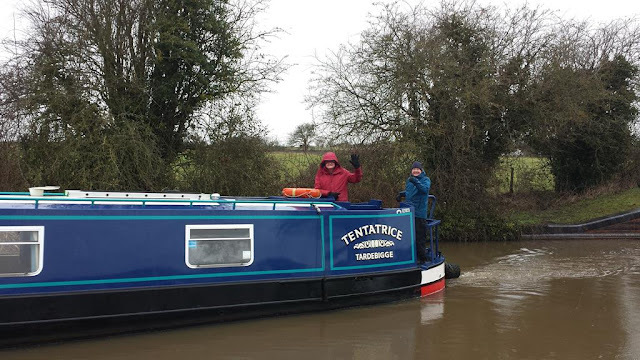 Monty and I walked down to lock 17, took Chris up the flight behind a hire boat with a crew of six who were amazed that, despite us having to empty their locks behind them, we still managed to catch them up! The final stop was at Crafted Boats where Monty and I walked over to the bottom lock at Stock Prior for Chris to go up, wind and back down again so we were facing the right way when it came time to leave. So all in all a very uneventful trip apart from one fairly major mishap. As a consequence of losing some weight my rings were all rather loose. I only ever wear my wedding ring when boating, but had not worn it all last summer as I was afraid of losing it, particularly as I wear locking gloves and felt it might come off with them. Having had three weeks back at home I had started to wear it again and yes, I forgot to take it off to do this trip and yes, I am afraid it disappeared somewhere en route. We re-traced my steps a couple of times, alerted C&RT to ask their staff and volunteers to keep an eye open for it, but to no avail. I even went to our local police station just in case someone had handed it in and that is when we discovered what policing is like these days. We have a new (about two years old) big shiny police station. I was expecting to go inside and talk to a nice kindly PC or Sergeant at the front desk, but no, not a bit of it. There is a sign telling you to press the emergency bell. I did and got a distant voice asking me which police station I was standing outside and if I had an appointment! The upshot was that I was instructed to go home and call 911!! A new ring has had to be purchased and my other three rings (engagement, eternity and my Grandmother's engagement ring) have been reduced by two sizes, so hopefully no more disasters on that front. We were not in a hurry so the jobs were done bit by bit in between other big jobs as they are really busy and had some deadlines to meet before the Tardebigge flight was shut in early January. So what were these jobs? Well some were routine - an engine service, new starter batteries and bow thruster batteries. The boat was there so long they had to winterise her for us. Our main request was to re-model the stairs at the stern - the original ones were steep with very narrow treads - great care was required when entering the boat ensuring you were holding on at all times. We had stuck some old bits of mat onto the old ones to see if that prevented some slippage. It helped a bit, but they needed to be changed. The challenge was to widen the tread without impacting on the cupboards either side. A friend came up with the idea of having the bottom step as a 'drawer' that slides in and out. The cupboards are not in constant use, so we are sure the modification will work. They are certainly easier to go up and down and still have storage space as the tops lift up. I have to say they also look a lot better than the old set. Next came two new table tops - the originals had a lip round the outside and very sharp edges. Also when they were clipped together to make a larger table there was a ridge in the middle. The new ones look much better and I am sure will be kinder on the forearms. Chris is very badly affected by light in the morning so we wanted something to block the portholes. I am not keen on bungs as I feel they get damp when the nights are cold, so they made us wooden covers that clip on to the frames. The wood in the picture looks different - that is my poor photography! In real life it matches well! We had had a problem with water collecting at the base of the side hatch, so much so that the wood had started to rot. They agreed that was a design fault which they have remedied and they replaced the wood charging us a fraction of the real cost. If you look carefully at the side hatch in the picture below you can see the discoloured wood. Finally they have rounded the corners of the TV unit in the saloon - when the tables are deployed making the passageway narrower the edge of the unit was at hip height and quite painful! So all that remained to be done was take her back to the marina. We have friends (Lynn and Mike) who live in Spain who were due to visit arriving Tuesday 13th Feb and leaving on Friday 16th Feb. We came up with a cunning plan to do the trip with them and a set of mutual friends (Chris and Marg) who have a home in Droitwich and another in Spain. It, however, had to be done on Wednesday as on the Thursday we were due to collect our grandsons from school. So would the weather be kind to us? I am afraid the answer was decidedly NO!! The rain started as we arrived at the boat and didn't stop until we about half and hour after we had arrived! Mind you we had, thankfully, moored up when the stair rods started. What we had not expected was the amount of ice that was still around. The decision had been made, we were all there raring to go, so we went for it anyway. The first problem was persuading the engine to start and then getting away from the side - the bow is very light as we had emptied the bow locker of coal, dog food and a myriad other things for the men to get to the bow thruster batteries. Also the water tank is empty and as a consequence we were stern heavy and grounded. The five of us were sent to the bow to think heavy!! We know how to make use of our friends!! Not quite what Mike is used to in sunny Spain, but he is still smiling! - or are they grimacing?! The noise got even louder when the were forced into the air when the boat approached! By the time we arrived Monty was beyond dirty despite the coat. There was only one thing for it - off to the dog shower. It did a good job, but ended up blocked - I had to go and confess all at the office, but was assured it was unlikely to be Monty's mud that blocked the drain - apparently people are using it to clean their boots! Back at the boat he was wrapped in his towel coat to dry off by the fire - lit before we left to thaw out the crew en route. So you have seen Chris, Mike and my Chris, but where were Marg and Lynn? Inside keeping cosy by the fire!! 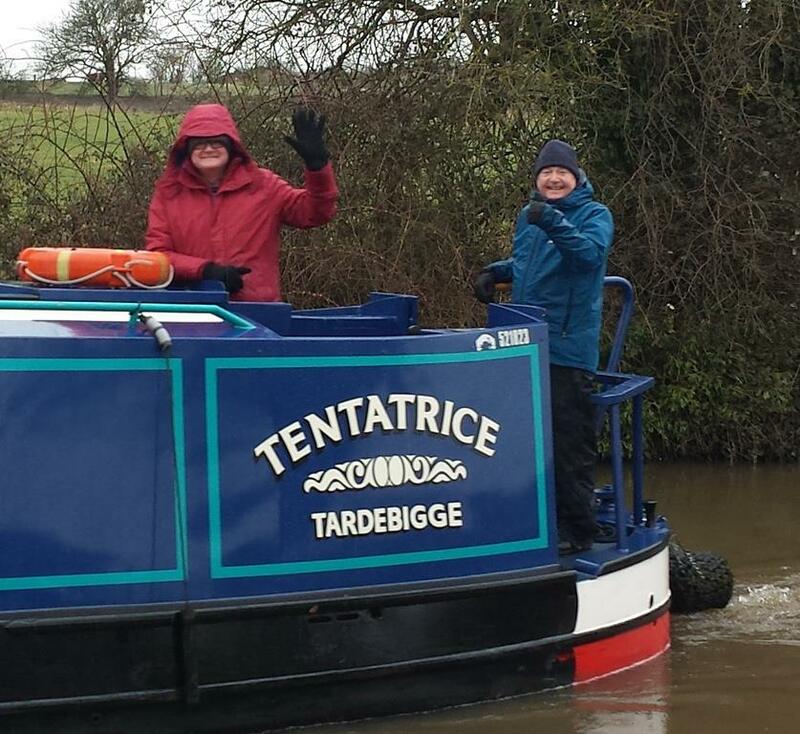 To be fair they had intended helping, but Lynn's boots had been left at their son's house, so there was no way she could tackle a wet and muddy towpath in the only pair of shoes she had with her, so Marg made the ultimate sacrifice and stayed in to keep her company! They were in charge of the kettle! A table had been booked at 14:15 at the Gardener's Arms (well it was Valentine's Day) where we were all able to relax, thaw out and chat. We all enjoyed a very good meal. Thank you all for your help - from casting off to mooring up took us about 2.25 hours. It would have taken the two of us on a good day nearer 3 to 3.25 hours. Next trip we will hope for better weather. So that is probably it until we set sail again in early April. Our first target is Trent Lock via the GU and Soar - we will probably do the Erewash if we have time. At Trent Lock we will meet up with Sue and Ken on nb Cleddau to do the reverse of the trip we did 4 years ago. Newark, Nottingham, Lincoln and on to Boston where we will pick up a pilot to cross the Wash to Kings Lynn. Then we will meander around the River Great Ouse and hope to do the Lark, Wissey, Little Ouse and Cam down to Cambridge before arriving in Bedford for the River Festival in mid July. We will head back along the River Great Ouse, up The Middle Levels and along the Nene. We will probably part company then as Cleddau is going north and we think we will make the most of our Gold Licence and head for the Thames and try to get down to Lechlade this year. Then home via the Oxford and possibly Stratford, The Avon, and then The Severn to Worcester. The final leg of either the Birmingham/Worcester Canal or the Barge Canal will be decided in due course. If anyone is around any of these places, please let us know as we would love to see as many visitors as possible.